Tyler Jones does not have any MLB stats for the season. Draft: 2011, Minnesota Twins, 11th rd. Tyler Matthew Jones... Is a 2008 graduate of Marquette University (WI) High School, where he lettered in both baseball and football and won two state baseball championships in 2006 and 2008. ..Played one season of baseball at LSU in 2011 after playing two seasons (2009 and 2010) at Madison Area Tech Junior (WI) College...Was a 2010 Junior College first-team All-American after helping lead Madison to the Junior College World Series. Attended spring training with Arizona after being selected by the Diamondbacks off New York's (AL) Triple-A Scranton-Wilkes Barre roster in the Rule Five Draft on 12/8...Was returned to the Yankees on 3/24 and spent entire season with Scranton-Wilkes Barre, where he led the staff in appearances... Averaged 10.74 strikeouts per 9.0 innings pitched, which ranked fifth among all International League relievers...Recorded at least one strikeout in all but six of his 44 outings...Went 6-2 with a 3.12 ERA (43.1ip/15er) in 28 appearances before the All-Star break and 0-2 with a 7.08 ERA (20.1ip/16er) in 16 appearances after the break...Was scored upon in each of his first two aapearances before not allowing a run in 16 of his next 18 outings from 4/15 to 6/7 (26.0ip/3er)...Went 5-0 with one save from 4/19 to 6/10... Had five-game winning streak come to an end on 6/20 after allowing two runs in 1.1 innings while being charged with a blown save and loss...Recorded third and final save on 7/15 at Buffalo... Did not allow a run in final six appearances (6.2ip) to end the regular season...Went 1-1 with a 6.48 ERA (8.1ip/6er) in 11 relief appearances while pitching for Licey in the Dominican Winter League. 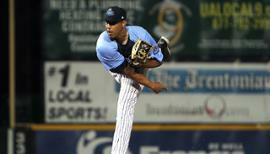 Went 6-2 with 11 saves, a 2.17 ERA (11 ER in 45.2 IP) and 67 strikeouts in 33 appearances for Double-A Trenton... Signed by the Yankees as a Minor League free agent on Jan. 3...Posted a career-best 13.20 strikeouts per 9.0 IP, highest among Eastern League pitchers [min 40.0 IP]...Allowed 1 run over his final 18 appearances (25.2 IP)...Recorded 2 saves and 8 strikeouts over 5 scoreless postseason appearances (4.2 IP)...Selected by the D-backs in the Rule 5 Draft on Dec. 8. May 22, 2018 Indianapolis Indians released RHP Tyler Jones. January 22, 2018 RHP Tyler Jones assigned to Indianapolis Indians. 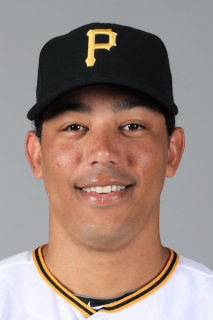 January 5, 2018 Pittsburgh Pirates signed free agent RHP Tyler Jones to a minor league contract and invited him to spring training. November 6, 2017 RHP Tyler Jones elected free agency. October 18, 2017 RHP Tyler Jones assigned to Tigres del Licey. September 18, 2017 Scranton/Wilkes-Barre RailRiders activated RHP Tyler Jones from the temporarily inactive list. September 12, 2017 Scranton/Wilkes-Barre RailRiders placed RHP Tyler Jones on the temporarily inactive list. April 3, 2017 RHP Tyler Jones assigned to Scranton/Wilkes-Barre RailRiders. March 24, 2017 RHP Tyler Jones returned to New York Yankees from Arizona Diamondbacks. December 8, 2016 Arizona Diamondbacks claimed Tyler Jones off waivers from New York Yankees. January 12, 2016 RHP Tyler Jones assigned to Trenton Thunder. January 3, 2016 New York Yankees signed free agent RHP Tyler Jones to a minor league contract. November 7, 2015 RHP Tyler Jones elected free agency. May 8, 2015 RHP Tyler Jones assigned to Mississippi Braves from Carolina Mudcats. April 6, 2015 Atlanta Braves signed free agent RHP Tyler Jones to a minor league contract. April 6, 2015 RHP Tyler Jones assigned to Carolina Mudcats. March 30, 2015 Fort Myers Miracle released RHP Tyler Jones. April 17, 2014 Fort Myers Miracle activated RHP Tyler Jones from the 7-day disabled list. April 1, 2014 Fort Myers Miracle placed RHP Tyler Jones on the 7-day disabled list. July 16, 2013 RHP Tyler Jones assigned to Fort Myers Miracle from Cedar Rapids Kernels. May 24, 2013 Tyler Jones roster status changed by Cedar Rapids Kernels. May 6, 2013 Cedar Rapids Kernels placed RHP Tyler Jones on the 7-day disabled list. May 24, 2012 RHP Tyler Jones assigned to Beloit Snappers from Elizabethton Twins. August 17, 2011 Tyler Jones assigned to Elizabethton Twins. August 15, 2011 Minnesota Twins signed RHP Tyler Jones.